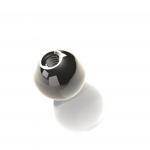 Blind Threaded 302 Stainless Steel Ball - ..375 Dia. M3 Thd. Blind Threaded 302 Stainless Steel Ball - ..375 Dia. M4 Thd.